A trained eye. Incredible style. Steady hands. This is unrivalled expertise. This is Rendez-vous Maestria, a one-of-a-kind celebration of Quebec heritage and architectural crafts. On the program? Age-old, cutting-edge and rarely-seen expertise in built heritage and contemporary architecture. A rich blend of wisdom and constructive energy. A plethora of outstanding discoveries. Everything an expression of continuity, identity and originality. For both professionals and the general public, Maestria provides the perfect opportunity to meet specialized artisans with a mastery of fundamental, time-honoured techniques. 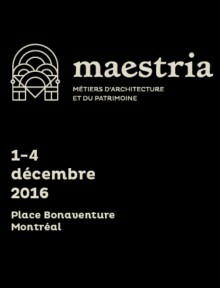 The Rendez-vous Maestria are destined to become the unavoidable event of heritage and architecture in Quebec.